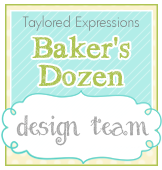 Hello everyone and welcome to day 1 of the Taylored Expressions October Sneak Peeks!!! 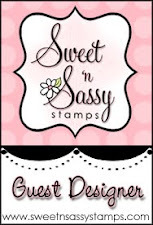 This is such a fabulous release...so many awesome stamp sets and dies...a new Matched kit with new card stock colors and 3 new embossing folders...Whoohoo!!!! 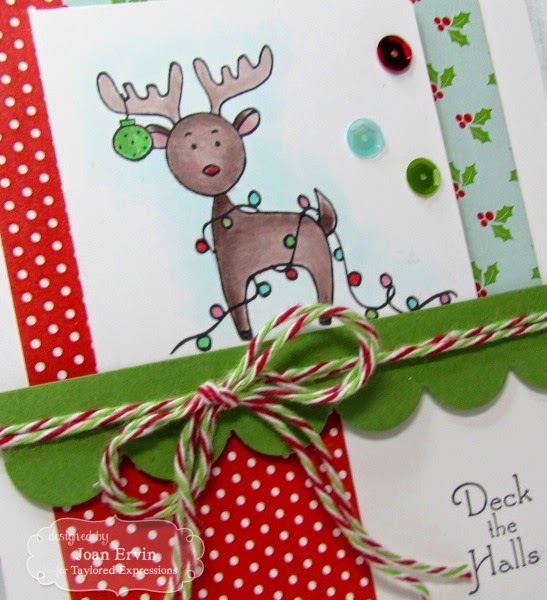 My first card features the adorable little reindeer from the new Deck the Halls stamp set...it was colored with Copics and a corner rounder punch was used on the upper right corner. Papers from the Gingerbread Lane 6x6 paper pack were used in the background and the previously released TE Medium Scalloped Border die was used to cutout the Granny Smith scalloped border. The Gingerbread Lane Sequins, twine, and the sentiment from the same set finish it off. the button, twine, and Gingerbread Lane Sequins finish it off. Thanks for visiting, crafty friends! 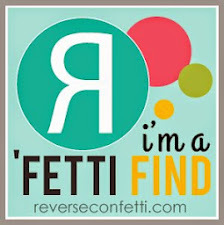 If you'd like to see more projects and new product information, please head over to the TE Blog for a complete blog roll of our participating designers...you will be blown away by all their awesome creations!!! 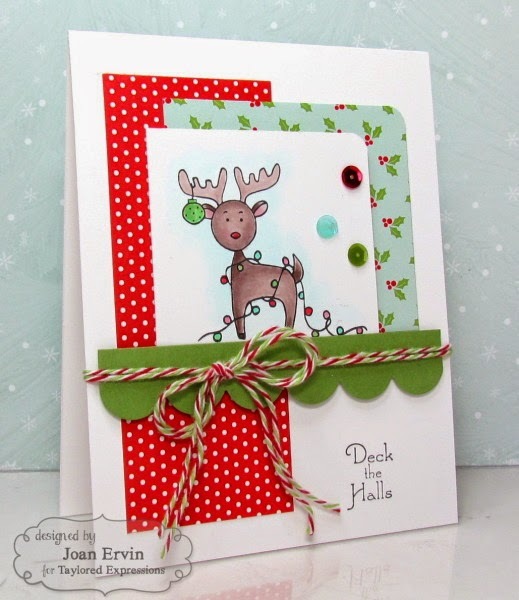 Darling cards Joan. Love the sweet images and the coloring. Your second card is amazing. Love the lay-out and the papers you used. Both of these are adorable and love your coloring of the images. What perfectly precious holiday designs, Joan!! 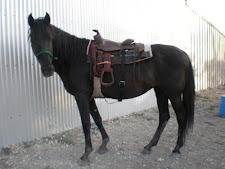 Too, too cute! Wonderful cards today Joan! 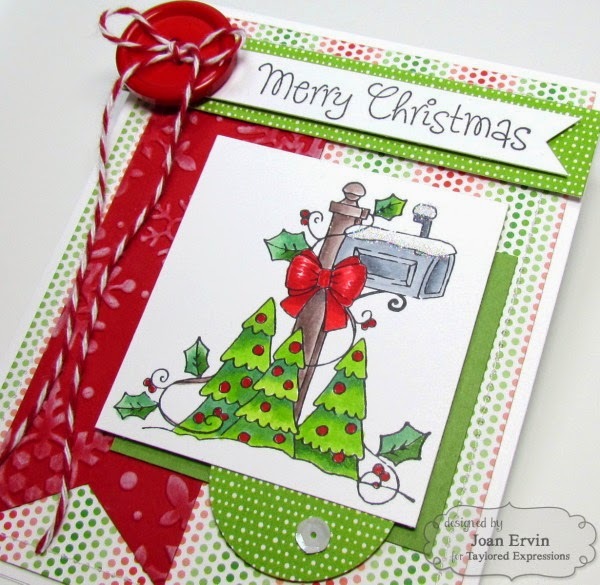 I love the layout of your first card and your mailbox card is just so fun! Ooh these are gorgeous Joan!! what fab images and both coloured beautifully! I love the scrummy papers and embellies. 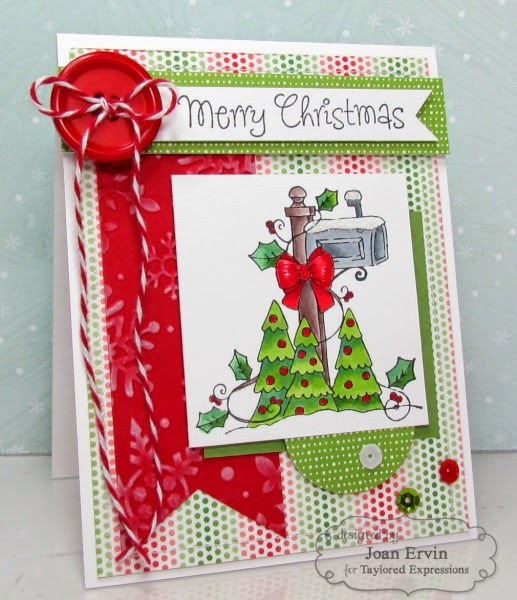 I really love the red and green twine… not seen that colour before and it's So pretty and perfect for Christmas! Love your cards today, Joan! Your coloring is gorgeous and I love your layouts! Hope you're having a great Monday! These are both amazing, Joan! Especially love the fun layout on the second! Hi Joan, I've looked through all your cards you posted while I've been MIA, each one is terrific and wonderfully designed! Your cards always amaze me! These are so sweet, Joan! 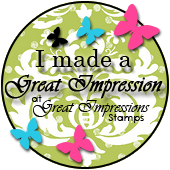 I love the images, and your designs showcase them so well! Beautifully done! Two fun, happy cards Joan.